Bored with F1, then watch this! The Austrian Grand Prix is currently on and for Red Bull and McLaren it’s become a penalty shoot out with all cars being sent to the back of the grid. Three of them are also being sent into the pits for further penalties. All this is a result of using too many engine components and the complicated penalties within the sporting regulations. All of a sudden the speed limits in place during the 24 hour race don’t seem too bad. 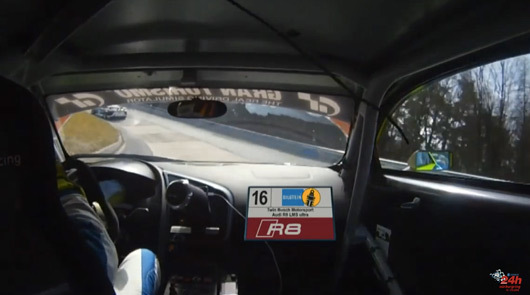 Here’s two on board laps that may well keep your attention better than the action in Spielberg. The first is from the #16 Audi R8 LMS, while the second was filmed onboard the #44 Porsche 911 GT3 R.
The fallout from the tragic accident at the Nürburgring in the VLN1 race back in March has continued with the track’s owners, capricorn Nürburgring GmbH, deciding to extend the speed limits initially introduced for motorsport only to all Nordschleife track activites. That means all Touristenfahrten days will have speed limits. All private track days will have speed limits. And all industry pool days will have speed limits. “Following the tragic accident on 28 March 2015, the German motorsport association (DMSB) introduced speed limits for races at the Nürburgring. capricorn NÜRBURGRING GmbH has decided to extend these speed limits to other activities on the Nordschleife, which is why record drives are currently not permitted on the Nürburgring Nordschleife,” said Carsten Schumacher, CEO of capricorn NÜRBURGRING GmbH. The VLN accident happened at the entry to the Flugplatz right hander where a Nissan GT-R got airborne over the Quiddelbacher Hohe “jump” and crashed into the crowd killing one spectator. The image above was taken in late April looking at Quiddelbacher Hohe, with the entry to Flugplatz over the crest. 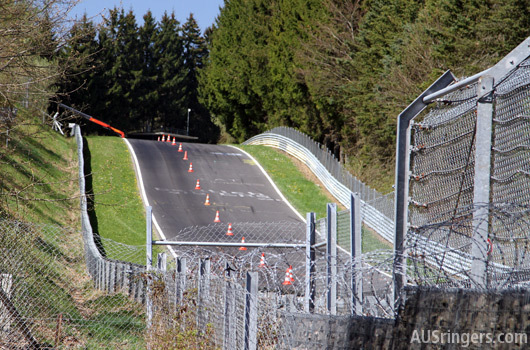 Workers were modifying the fences around the spectator area ahead of the VLN2 race. A 200km/h speed limit applies from Hocheichen to Flugplatz (all activities). A 250km/h speed limit applies from Flugplatz to Schwedenkreuz (all activities). The usual 90–50km/h speed limits apply on the approach to the Breidscheid Bridge track entry (TF only). A 250km/h speed limit applies on the main Döttinger Hohe straight, from the “gantry” to Antoniusbusche (all activities). The initial introduction of speed limits for VLN competition, including the Nürburgring 24 hour race, was hoped to have been an introductory measure that was able to be brought in relatively quickly while a longer term solution was developed. 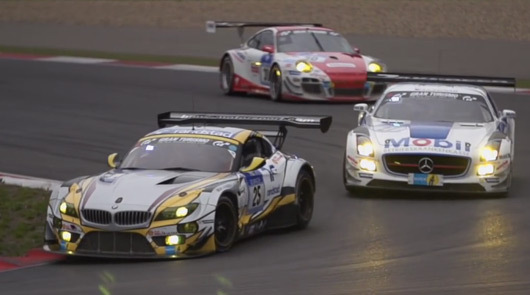 Team Marc VDS has put in strong performances at the last two Nürburgring 24 hour races, but unfortunately the team is yet to experience the top step of the podium. After finishing second at this year’s race we’re left with this pretty cool slo-mo video. Check it out after the break. Have you ever wondered what it would be like to drive a lap of the Nürburgring at 3am during the 24 hour race? Wonder no more, strap yourself in for a ride with Dale Lomas at the wheel of his #underdog BMW 330i. Make sure you keep an eye in the top right of screen for approaching traffic too. Lamborghini has shown with its outrageous Aventador LP 750-4 SV that you don’t need a tricked up über hybrid to break seven minutes at the Ring. You just need a 750hp normally aspirated 6.5 litre V12. Some pointers to note, the indicated peak speed at Schwedenkreuz was 297km/h, a staggering a 285km/h down the Fuchsröhre and 325km/h into Tiergarten. You won’t find too many cars able to top those speeds. But with a final lap time of 6:59.73 that should come as no surprise! The Nürburgring 24 Hour race debut of the all-new Audi R8 LMS went very much to plan with the #28 Audi Sport Team WRT entry claiming victory after controlling the last six hours of the race. 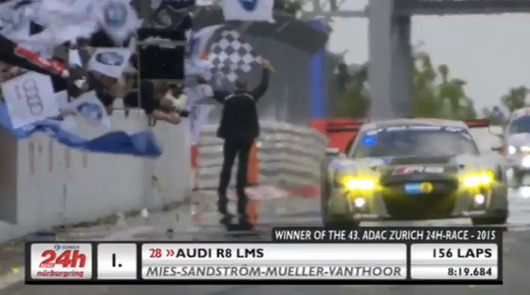 It is Audi’s third win at the N24 and an R8 has claimed victory in three of the last four races. While today’s was a victory that looked safe in the closing stages for the Audi, the winning margin of 40.7 seconds from the #25 MarcVDS BMW Z3 GT3 is the narrowest in the race’s 43-start history. Porsche claimed the final podium position with the #44 Falken Motorsports Porsche 911 GT3 R.
The relative calm enjoyed after sunrise belied the drama that took place overnight with rain and accidents causing chaos at the head of the field. In the end a total of 156 laps were covered, three less than last year’s distance record. That’s a very good effort given the 2015 race saw the introduction of speed limits in three sections of the track (200km/h at Flugplatz, 250km/h at Schwedenkreuz and 250km/h at Döttinger Hohe) in reaction to the tragic crash which claimed the life of a spectator in the VLN1 race back in April. Thankfully there were no major incidents in today’s 24 Hour race and it remains to be seen how much longer the speed limits will stay in force. For now though, congratulations to the winning Audi team. May your well earned celebrations go long into the night. Congratulations to all the Aussies and Kiwis who took part in the 2015 Nürburgring 24 Hour race and especially to those who were there at hour 24. Peter Scharmach (NZL), part of the #91 Porsche 911 GT3 MR team, was the first antipodean across the line, finishing 25th outright. Mal Rose (AUS) and Peter Leemhuis (AUS), in the #49 Aston Martin V8 Vantage, finished first in class (SP8). AUSringers supporter Wayne Moore (NZ) came home second in his class (SP8T) at the wheel of the #51 BMW 335i. It’s a great effort for all of our “local” drivers to keep going back to the Ring with ever increasing demands on qualification for the race. We hope to see solid contributions from you all in years to come.